This compact mound forming evergreen shrub with attractive dark green tear shaped leaves and compact habit provides AYR interest. Sweetly scented white flowers provide interest in early winter. 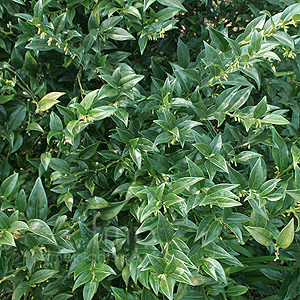 Cultivation tips: Sarcocca flourishes on most free draining soils, especially chalky conditions. This evergreen is suitable for planting under shade - making it useful for problem shady areas. Water occasionally if very dry - mulch on poor soils. 2m tall X 1m.